The Flying Tiger crash was not your typical disaster in many ways, beginning with the fact that it was not simply a big bang crash, but was a disaster drawn out for many hours and even into days! The drama started when engine #3, the engine immediately to the right of the cabin, began firing sparks and burned out in a flash of flames. The pilot crew squelched the flames in short order, and within minutes, the cabin was aware that there was a problem.The crew began to calm the passengers as a prelude to prepping them for a ditching drill, just a little at a time. That prepping process was stretched over hours as the situation turned more and more hopeless. Later, “Remove shoes, pass them to the center isle.” Then, “Put on life vests, and here is how you inflate them.” And on and on. All of the time passengers were assured, “This is only a drill”. Nearly five hours passed between the first indication of serious trouble and the ultimate crash. Most passengers harbored the strong suspicion that the end was very near and the ultimate ending might be very violent indeed. It was to be just a ditching exercise, more or less routine, if such a thing could be routine. The winds were howling at nearly 50 miles per hour and the ocean was a rage of 20-foot tall waves and swells. If the ditching had been successful, according to the manuals, the plane would skip along the water surface, perhaps with three separate thumps, and would then come to a stop. The passengers would step out onto the wings of the floating plane, and then climb into one of the five 25-person life rafts, all in a very orderly fashion. However, the ditching did not end that way, despite the wishes of 76 on board. The Super Constellation crashed. It did not skip on the surface. The crash was so violent that the hull tore open and the right wing tore off. The winds were so powerful that within minutes the four life rafts that were supposed to be in the wings were blown away, out of reach of everyone except a lone stewardess who had absolutely not chance of surviving the cold. One raft survived. It was the one that was tossed out of the cabin by hand from the back door. It was the sole 25-person raft remaining. Fifty one people piled in. It was totally over crowded. The combined body weight dangerously submerged the rubber raft, filling it with water which was regularly refreshed with frigid sea water from the giant cresting waves. To the advantage of the survivors, the severe crowding and bunching up of passengers in that tiny rubber raft made it possible for most to live as a result of their own body heat. In the frenzy of escape from the sinking plane to the freezing water and to the only means of salvation, the raft inflated upside down. At that the time, upside down meant that the safety lights and the emergency medical kit were facing down, into the water, and totally out of reach. No one was willing to get out of the raft in order to turn it right side up. The plane sank quickly, by some estimates were within five minutes, but others suggested 15 minutes maximum. Those who made it to the raft were on board the crowded raft within 20 minutes or they never made it at all. The high winds immediately took hold of the raft and its cargo and drove it for nearly six full hours, a total of 22 miles. A Swiss freighter ship, the Celerina, intercepted the SOS and diverted to attemp a rescuse operation. It was able to find the upside-down life raft with the lights facing into the ocean depths as a result of two airplanes that diverted their course and began dropping location flares. The seas were ferocious and bittlerly cold, but intermittently lighted by the lights of those rescuers. Once the interception was complete, the Celerina crew brought all inside and found warm clothing and bunks for everyone. 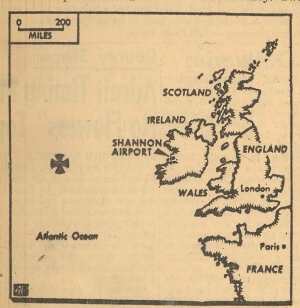 The following day was wracked by the same raging storm, however one rescue helipcopter was able to get close enough to to evacuate the four most severely injured and three deceased to Shannon, Ireland. It was not until the third day that the next of kin of those involved could be informed of the survival or death of their loved ones. On that third day, the skies cleared and by that time the ship was off the coast of Cork, Ireland. Seventeen more were evacuated by helicopter. The remainder continued on and finally debarked in Antwerp, Belgium, along with a bit of military and public welcome. This entry was posted in flight crew, new combat troopers, passengers, rescue teams and tagged Flight 923, Flying Tiger, Flying Tiger 923, liferaft. Bookmark the permalink. People are connected to this crash in many ways, probably in many ways you can’t even imagine. My son Jeff learned of the crash in one of his aviation courses as lessons learned from your experience is the reason there are now lights on life rafts on aircraft. I’ve always been rivited by the story of the ditching of N6923C. In the late 70s and early 80s, I flew it’s sister ship, N6922C, on cargo flights out of Miami. I was a young co-pilot then. Interestingly, N6922C eventually was sold to a Dominican Republic airline, AMSA, and flew into the 1990s before being damaged beyond repair in Borinquen, Puerto Rico, where it remains to this day. By a twist of fate, in 1987 AMSA bought an ex-USAF Super Connie, which I flew as flight engineer for the ferry flight. It met it’s fate in 1990, when it ditched off San Juan. It’s last flight was three-engine ferry that incurred an uncontrollable fire on a second engine. Then, the flight engineer on that fatal flight committed the same error as on N6923C: He shut off the oil to #1 engine, causing it to fail. With just one operative engine, a ditching was inevitable. The captain, Bill Bailes, did not survive the impact. Those who fail to learn from history are doomed to repeat it.